The Farm Life is a 3 part series on Organic Farming. Organic farming puts us in touch with nature and helps us understand how much we depend on the environment. It’s also a fun, low-impact activity that is great for all ages. Part 1 in the series is for those that would like to gain a deeper understanding of their food and how to grow it. 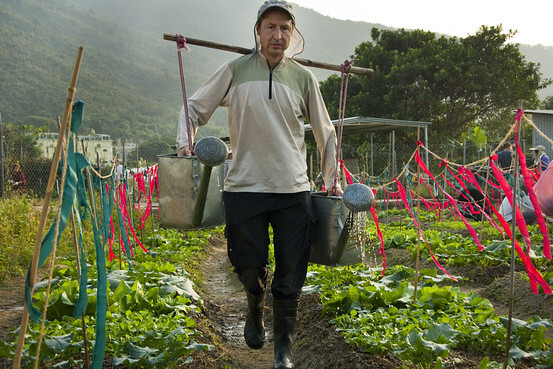 Over 97% of Hong Kong’s vegetables are imported, making us especially vulnerable to Mainland food safety issues. Vegetables in particular are susceptible to heavy metal pollution in the soil, a serious issue in highly industrial Guangdong, which is the source of a large majority of Hong Kong vegetables. Organic farming is a great way to learn about growing food, how to select safe, healthy produce, and enjoy the great outdoors. Part 2 will be for those that are looking for fun weekend activity with less of a commitment. In part 3, we will look at travel and farming through World Wide Opportunities in Organic Farming (WWOOF). The 8 weekend organic farming course held each year by Sustainable Ecological Ethical Development (SEED) foundation requires some commitment but is truly the most satisfying. Not only will you learn about growing food, you will plant and harvest a delicious crop of farm fresh organic vegetables. The program is divided into 2 parts. Saturdays consist of a lectures series (in Cantonese) on agriculture, organic farming, composting, farm skills, soil, plant pests and diseases. You will learn all sorts of interesting facts about food that will make you a more informed shopper. After all, we eat 3 times a day, isn’t it worth investing time to learn about our food? You will learn, for example, that Hong Kong, unlike most other developed countries, doesn’t have an organic labeling law, so you need to be vigilant when shopping. Sundays consist of field work and growing your own vegetables. This course is about the sheer joy of growing your own food and reaping the rewards of your labor. There is nothing more satisfying than seeing the seeds you’ve planted grow into healthy vegetables you can take home and enjoy with your family. You will learn to grow leafy greens like lettuce, pak choi, choi sum, kai lan and also crops such as sweet corn, carrots, broccoli, and tomatoes. This experience will give you a deep appreciation of food. The class is taught by a Master Farmer, Fai Sir, and a team of assistant instructors. Lessons are in Cantonese, but Fai Sir and the other instructors are very helpful in assisting non-Cantonese speakers. The only drawbacks are the 8 weekend commitment (but like most things in life you get what you put in) and the small classroom which can get a little stuffy. All in all, organic farming gives you a sense of accomplishment that no leisure travel can. Ready for a new low-carbon experience? For more details about the course, please visit SEED. See what the Wall Street Journal has to say about the course here. Stay tuned next week for part two of our Organic Farming series: renting your own patch of land in a community style garden.